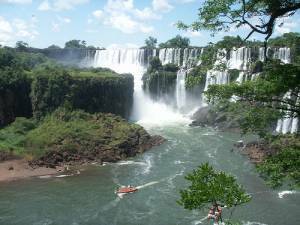 The Northeast Littoral is a region best known for its most stunning natural wonder: Iguazú Falls. Among the third largest waterfalls in the world, the majestic cataratas, as they are called, are an essential stop for any traveler to Argentina. Nearby in the Misiones province are 17th century Jesuit ruins that are also a must see for visitors who are interested in history, architecture, native culture and religion. Though the ruins and the falls are the most well known sights in the region, the area holds many more treasures worth taking the time to discover. Although there aren’t quite as many bus routes in the lesser known destinations, most towns and places of interest have the necessary on-site infrastructure, and this region’s air of authenticity is a refreshing change from areas that are more accustomed to catering to foreign visitors. The region includes the provinces of Misiones and Corrientes to the northeast, that of Entre Ríos to the south, and Santa Fe, Chaco and Formosa to the west. The Uruguay River marks its eastern border, separating Argentina from Brazil and Uruguay, while to the north the Paraná and Paraguay Rivers mark the border with Paraguay. To the west are the Northwest Sierras, further south the Sierras of Córdoba, and finally the province of Buenos Aires. This region is first and foremost a humid area. Between the subtropical forests of Misiones, and the presence of the two large Uruguay and Paraguay Rivers that give the province of Entre Ríos, “between rivers,” its name, humidity is generally characteristic of the region. The northernmost areas can also become very hot in the summer, but the south has a more temperate climate, that doesn’t become too excessive either way. The many beaches along the coast of the Uruguay River are popular vacation spots in the summer months. Culturally, this is a very appealing region. Its cities harbor unique colonial architecture, its forests hide the ruins of Jesuit settlements, and it is one of the areas where the most native groups still live today. The Guaraní indians, in particular, still live throughout the region, and make a living largely from the tourism that comes to the area. The coast along the Uruguay River is the site of many carnivals in the summer months. The carnival of Gualeguaychu is particularly renowned. The National Park of El Palmar is also found along the coast; a natural palm grove in an essential flat region, it is a spectacular place to camp along the banks of the river. The seeds of these palm trees are said to have been carried all the way across from Brazil, creating this unique park. In terms of food, this is also one of the regions where fish is a part of the traditional diet, due to the presence of the two rivers. If you’re craving for a break from meat, you’ve found the spot! Finally, this is the area where yerba mate is cultivated. Fields, warehouses and factories where the mate is processed and packed for the country’s consumption can be seen on trips throughout the region. More remote, the provinces of Chaco and Formosa see much less tourism. However, they both contain sites of interest, depending on your travel style. Both are more mountainous than the rest of the region, and are covered in dense forests. Several native groups still live here, and are helping to develop ecotourism in the area as a respectful and sustainable travel alternative. The geography of the area is also conducive to adventure tourism, which has recently become more accessible. Chaco is also known in particular because it was the scene of an important meteor shower 6,000 years ago, which shaped the landscape. Some of the largest meteors in the world can be found here, and attracts both scientists and curious travelers. This page rendered in 0.984 seconds.